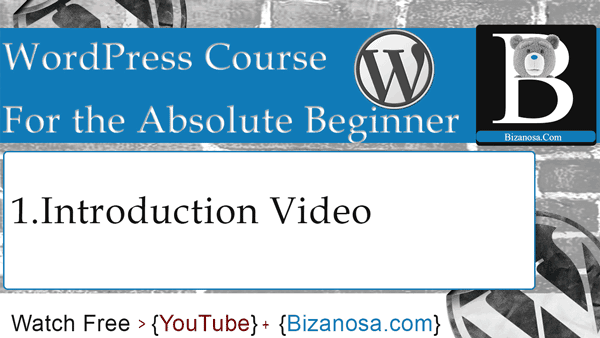 Hi and welcome to this Bizanosa course on WordPress. This course will cover WordPress. The assumption is that you are an absolute beginner and that is why I will teach you like a beginner. If you want to learn WordPress, this is a good cause to start with. This WordPress course is part of a set of series , a set of WordPress courses, that I will be working on in order to teach you to be very good in WordPress. Not just good, but to be very good in WordPress. And this is the first course that will get us there. So let us see some of the elements we’ll be taking a look at about WordPress. I will use Xampp throughout the course. Xampp is a package that will enable us to run WordPress on our local computer. I will create the website on my computer. And we will start by installing Xampp. After Installing Xampp, I will create a database which we will use for installing the WordPress website. Then after that I will show you how to install WordPress through your browser. Once we install WordPress, we are going to take an overview of the WordPress Dashboard and see what we have in the Dashboard, which features are available on the dashboard and what you can do directly from the Dashboard. After looking at the Dashboard, we are going to see an overview of some WordPress settings. We will then look at Posts and Pages in WordPress. We will see the difference between posts and pages. Then we will create a post, we will also create a new page. Then we are going to set up a blog page , we will also set up a home page .We will see how to set up a homepage in WordPress. After creating the pages and posts, I will show you how to work with Menus. You will learn how to work with menus in WordPress . So you will create a menu that will enable you to navigate through your website and will enable visitors to navigate through your WordPress website. After that we will look at plugins. You will see some plugins, you will see how to install plugins. How to manage your plugins, how to delete plugins and any other things that we will cover during this particular section on plugins. We are also going to take a look at themes . We will learn how to install themes .We will learn different methods of installing themes. You will also see how you can uninstall a theme. If you do not like a theme anymore ,you can uninstall the theme. You will see how to do that . After that we will got to WordPress Users. You will see how to add users, the different types of users that are available in WordPress .You will also see how you can change profile settings. Then we are going to end the course by looking at the WordPress settings ,settings that we probably did not touch on in the first part when we were looking at WordPress settings That will be the end. I will give a final video on what next when it comes to WordPress . So let s get down to it and let us start learning right away. See you in the next video, where we will start by installing Xampp and creating a database.